VietNamNet Bridge – Hau Thi Ca, a three-year-old ethnic Mong girl, lives in Thao Chu Phin Village and it takes her two hours of climbing up and down mountains to go to school. 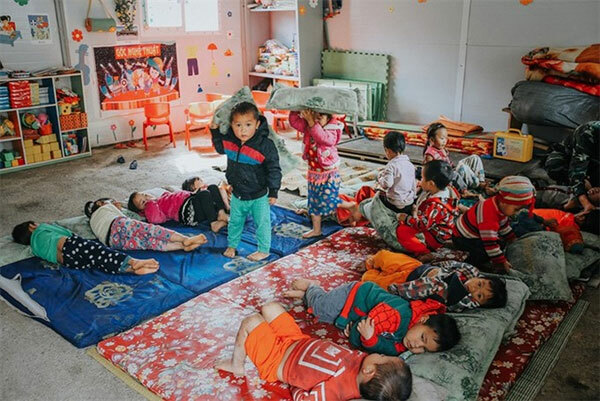 Like Ca’s parents, many other ethnic Dao minorities take their children, often aged between three and five years old, to school, leave them there all week and return home. At first, two teachers Chu Thi Nhi and Nguyen Thi Hong were discouraged. “I feel tired when looking after my five-year-old child, but now I have 14 students, like 14 children. The smallest is too small to speak fluently, and cried whenever she sees the teacher,” said Hong. During the first month of the school year, Nhi and Hong took turns to lie besides the smallest student so that she would think they were her mother. Nhi and Hong also had to bathe and feed the student. “We work from 6am to 11pm. When we return home at the weekend, we have dark rings under our eyes,” Hong told Thanh Niên newspaper. Nhi remembered that by the beginning of November last year, four-year-old Hau Thi Chua had a bellyache and vomited at night. Nhi and Hong had to travel through the forest, climbed up and down mountains for two hours to a communal medical station. At dawn, the two teachers returned to school with scratched faces. “We held each other and cried. Fortunately, the student was safe,” said Nhi. On Sunday afternoon, Nhi and Hong drove an old motorbike to transport vegetables, meat, fish sauce and salt, traveling for more than 40km from their house in Tam Son Town to Bat Dai Son Commune. They leave the motorbike, and then carry the food up the Bat Dai Son Mountain to reach the school. “The mountain is full of obstacles and we can easily fall down if we are not careful,” said Nhi. It takes them two hours to crawl up the mountain. Reaching the school, Hong lights up an oil lamp whereas Nhi slices and roasts pork to prepare food for their students. When they run out of pork, they will have chicken and roasted peanuts. The two teachers go to bed early, because it is the most peaceful night for them during the week. The next day, they will look after 33 students in the day and 14 ones at night. The 14 are between the age of three and five. Chu Thi Nhi, 39, has two sons. Her first son studied far from home, and the second son is five years old. All of her family work is done by her husband Mai Duc Trung, who is deputy chairman of Bat Dai Son Commune. “I intended to take my second son to my school, but the mountain was too high and I cannot carry him,” she said. Nguyen Thi Hong, 28, also has two sons. Seeing Hong work hard at school, her husband Leo Duc Trung gave up work for a year to help. As Bat Dai Son Commune is a remote area, local residents worry that the two teachers could be kidnapped, so they assigned Hau Mi Lung, 50, to look after the two teachers, and help them in taking care of the students. Cu Mi Say, a local resident, also came to help. Say, 35, is blind and not married. “If the two teachers do not come here, the village will be very sad,” said Say. All people in the village love the teachers. They share their pork, chicken and all their specialities such as maize powder and maize liquor. Every afternoon, local residents help Nhi and Hong cook meals so they have a little free time. The 33 students of the Thao Chu Phin School receive an allowance of VND139,000 (US$6) per student per month. For the 14 students who stay at the school all week, their parents hand in VND30,000 ($1.3) per month.